5.0 (based on 2 ratings) Thanks for your rating! Product #52126 | SKU AL-MX | 5.0 (based on 2 ratings) Thanks for your rating! Designed with a metal body and SMD LED bulbs, the AL-MX is the most durable, powerful, bi-colour LED light yet, and easily fits into your pocket. The AL-MX is more powerful than any other light of its size. It packs 128 SMD LED bulbs into a credit card-sized panel. With both CRI & TLCI ratings over 95, and a wide 120° beam angle that outputs 3200 lux at 0.3m, the possibilities for this light are endless. 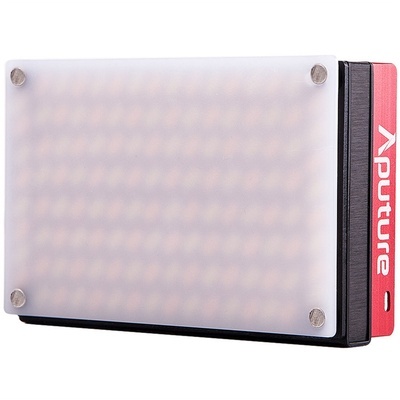 The AL-MX features a 5-step adjustable colour temperature ranging from 2800-6500K. While most bicolour lighting fixtures range from 3200-5600K, this expanded range provides you with even more options for creative applications. The AL-MX is compact and durable. Made of aircraft-grade aluminium and featuring an extremely efficient heat management system, the AL-MX is built to last for years in conditions of all kinds. In addition, with a 1/4 screw and universal cold shoe mount, you can easily install the AL-MX on cameras, light stands and so on. The AL-MX also comes with a bonus Boost option, which goes above 30% of maximum brightness when you need that extra kick. Capable of operating at 60-second intervals, boost mode gives filmmakers one more option for when "the brightest ever" still isn't enough. AL-MX has a new form of technology that increases its reliability. While many lights dim as battery life decreases, the output of the AL-MX remains the same no matter the remaining battery life, environment, temperature or any other factors. Internal lithium battery lasts an average of 1 hour 2 at full power and 4 hours at minimum power USB-C power: because Micro-USB is dead : ) Solidly constructed with an efficient heat sink. Diffusion: frosted plastic plus flexible gel are a great combination super easy to use.